Leaving Mount Beauty drive 5kms towards Tawonga and turn down Mountain Creek Road to the Mountain Creek picnic ground. From here the road turns into a rough 2WD (dry condtions) or easy 4WD unsealed road through to Mitta Mitta. From Mitta Mitta travel 77 km on sealed roads along the Omeo Hwy until you reach the turn off to the Bogong High Plains to Falls Creek. Follow Bogong High Plains road along to Falls Creek, Bogong Village and back to Mount Beauty. Leave a full day for this trip and stop in to Lake Dartmouth, Glen Wills Cemetery (located between Glen Wills and Glen Valley) or detour and stop in at Anglers Rest for a drink at the Blue Duck Inn. Depart Mt Beauty heading north along the Kiewa Valley Highway, continue through Dederang and turn off to the left to Yackandandah. It will take 45 minutes from Mt Beauty to arrive in Yackandandah township, this historic gold town has many quaint shops, gallery's and a museum. From Yackandandah head to Beechworth, Beechworth is famous for its bakery, historic buildings and Ned Kelly Ledgends with plenty to do and see. From Beechworth follow the signs to Myrtleford, driving along the Great Alpine Road towards Myrtleford you will glimpse your first views of Mt Buffalo off to the right. As you drive along you will pass orchards, walnut and chestnut farms, old tabacco growing plots. 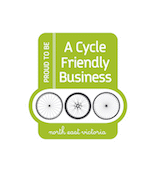 Have a look at Myrtlefords town centre and continue along past the Happy Valley pub and turn left at Ovens follow the steadily winding road, you will arrive at the T intersection of running creek road and kiewa valley Hwy, turn right for your return to Mt Beauty. Start your Alpine discovery loop from Mount Beauty, taking the Bogong High Plains Road to Falls Creek. Your journey will take you past Bogong Village, located half way along the drive between Mount Beauty and Falls Creek, and Fainter Falls, both definitely worth dropping in to stretch your legs. Continue on and travel through Falls Creek, following the sign to Omeo. 7.7kms past Rocky Valley Dam travel you may take a short walk to our oldest still standing cattleman's Hut; Wallace's Hut, set amongst a magnificent display of snow gums. Just a little further along and also a short walk from the road is Cope Hut. Travel further South to Anglers Rest and then through to Omeo, a town which boasts a fascinating gold mining history. After leaving Omeo on the Great Alpine Road, look for the turn off on the right to Victoria Falls Oriental claim, a site of original Chinese Diggings. Stop into Dinner Plain, a high altitude village snuggled between the snowgums, for a coffee, year round activities and a look around the village with its unique housing, cafes and restaurants. Continue on through Mount Hotham, the highest sealed road in Australia that is open year round, and back down the mountain to Harrietville. From Harrietville drive back towards Bright, taking the Tawonga Gap Road back to Mount Beauty, making sure to stop in at the lookouts along the way. Driving 240 km on some of Australia's highest roads, the loop would take you 5 hours without stopping. 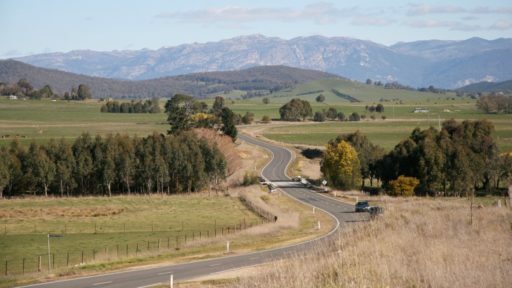 Follow the Kiewa Valley Highway from Mount Beauty through Dederang, cross the Kiewa river to Gundowring, following the road to Red Bluff intersection. Take Locharts Gap Road through to Eskdale, then the Omeo Hwy to Mitta Mitta. Return to Mount Beauty via the same route or take the unsealed Trappers Gap track back to Mount Beauty. Travel from Mt Beauty down the Kiewa Valley Highway and turn left to Myrtleford at Running Creek. You will pass through a small section of winding road then enter the Happy Valley driving through Rosewhite and meet the Great Alpine Road at Ovens. Turn right and drive a short distance and you will discover Myrtleford. Depart Myrtleford and follow the Great Alpine Road to Porepunkah and on to Bright. 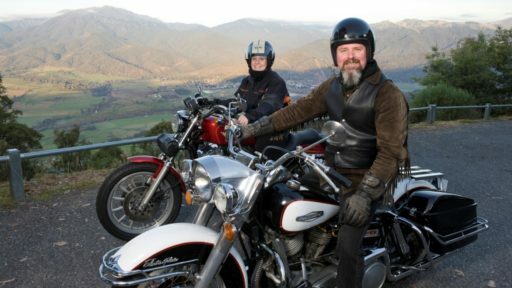 Travel out of Bright on the Great Alpine Road and turn left across the Tawonga Gap to Mt Beauty, you will discover breathtaking views of the Kiewa Valley from the lookout at the top of Tawonga Gap. Made famous through the movie "The Man From Snowy River", the spectacular alpine high country of eastern Victoria must be one of the best regions in the world for 4WD touring. Meet nature on its own terms in this park that protects the state’s highest mountains and pristine alpine environments. Some of the tracks deep in the park are for experienced four wheel drivers only, but there are many other tracks where you can get away, enjoy beautiful views, and appreciate the quiet wonder of the alps.